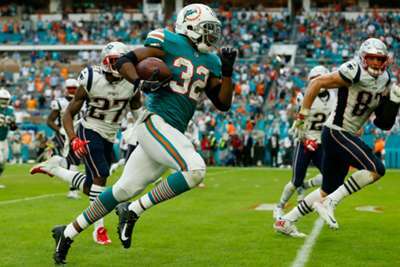 The Miami Dolphins produced a sensational finish to beat the New England Patriots on a miraculous final play on Sunday. Miami trailed the Patriots by five with seven seconds to play and the ball on their own 30-yard line. Dolphins quarterback Ryan Tannehill received the snap and completed a pass over the middle to Kenny Stills. The Patriots defense converged on Stills before he pitched the ball to DeVante Parker, who quickly flicked it to Kenyan Drake. Dolphins running back Drake then broke a tackle, turned up field and ran into the end zone to give his team a remarkable 34-33 victory. Tannehill threw for 265 yards and three touchdowns in the game, while Tom Brady completed 358 yards and three scores through the air for the Patriots in the losing effort. The Dolphins moved to 7-6 for the year with the win, while the Patriots fell to 9-4.